Old timers may recall a hit show of early television titled, “Queen For A Day.” Houston fun-seekers may want to hurry over and join the party at the Hobby Center for what one might now designate as, “Queen For A Night.” The current offering there by Theatre Under the Stars is the colorful and ultra-camp frolic titled, PRISCILLA Queen of the Desert. Guys and gals attending performances of this touring production of the Broadway musical are reminded to wear their feather boas and leave their inhibitions at the door. When the countless eye-popping costumes (designers, Tim Chappel & Lizzy Gardiner), and the rainbow magic of the psychedelic lighting (designers, Nick Schlieper & Jonathan Spencer) begin to surround you, don’t be surprised if you find yourself thinking you are watching a Mardi Gras parade in The Big Easy. WOW! Directed by Simon Philips, this musical edition, based on Stephan Elliot’s 1994 Australian comedy-drama film, “The Adventures of Priscilla, Queen of the Desert,” has had numerous incarnations for the stage since debuting in 2006 in Sydney, Australia, and then branching out to the United Kingdom, New Zealand, Canada, Broadway and beyond. Set in Australia, the nutty plot first brings us the drag queen, Mitzi Mitosis, hilariously played by Wade McCollum. A performer in a tacky Sydney nightclub, Mitzi’s real name Anthony “Tick” Belrose, and he has been separated for many years from his wife Marion (a sweet portrayal from Christy Faber), but not before the two produced a child named Benji (young Shane Davis at the performance I attended) and Tick took off to follow his destiny as a gay man. Benji is eight years old now and wants to meet his dad, so Marion has asked Tick to come out to meet him and be a headliner at her casino nightclub in the Australian desert town of Alice Springs. A really funky tour bus is acquired for that trip. Coming along for this great adventure is Tick’s recently widowed and transsexual friend, Bernadette (a tender portrayal from Scott Willis). Rounding out the touring trio is Tick’s flamboyantly gay friend, Felicia (née Adam) with a merrily campy portrayal from Bryan West. 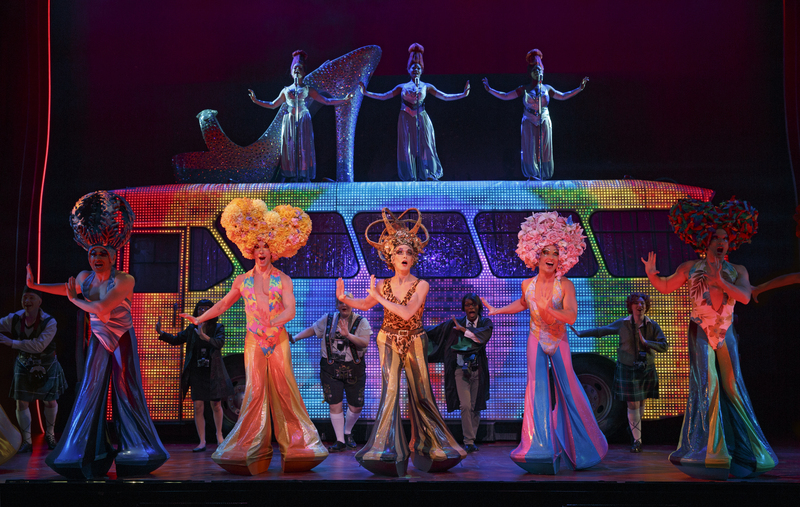 The three name their bus –you guessed it—“Priscilla, Queen of the Desert,” and off they go on a series of adventures driving from Sydney to Alice Springs. When bus troubles develop, they acquire another pal to join them, a cheerful straight mechanic named Bob (Joe Hart), who will hit it off surprisingly well with gay Bernadette. Not all of the adventures are pleasant, as when small-minded small-towners along the way have hurtful anti-gay mentalities. The show touches gently on such hints of discrimination, many of which seem somewhat out of date now that gay marriage options are sweeping the globe, but the real message here is both musical and visual. The extraordinarily creative and deliciously outlandish costumes for this sizable cast are a key element of the unique glue that holds the zaniness together. Another is the very upbeat score comprised of countless pop songs that have echoed through many a disco in decades gone by, and remain favorites ’til the present day. Finally, that ever-changing psychedelic lighting brings a new look to every scene, and that is no small accomplishment since, with the exception of the fascinating exterior and cutaway interior of the cleverly created bus (designer, Brian Thompson), or the distant twinkling of a Sydney bridge, sets and scenery are minimal to non-resistant for this traveling production. But that does not prevent the show from exploding with energy that the audience finds infectious. Highlights of the very danceable music (choreographer, Ross Coleman) featured such familiar tunes as “What’s Love Got to Do With It?” Nik Alexzander delivers this savage and wiry opener while mini-skirted in fringed bright scarlet. In the role of Miss Understanding, his was a blistering, anorexic send-up of singer, Tina Turner, and the audience ate it up. Other hit songs that pepper the proceedings include, “I Say a Little Prayer,” “Material Girl,” “Like A Virgin,” “I Love the Nightlife,” “True Colors,” “Thank God I’m a Country Boy,” “Hot Stuff,” and a charming, “Mac Arthur Park. By way of cautionary notes for those planning to attend, the theatre does warn that the content would garner the ‘R’ rating if this were a film. That would be due largely to some coarse language and adult situations not really designed for youngsters (or the faint of heart). Another issue that has been a continuing concern in this theater is the tendency to over-amplify productions. I suspect this may be the work of young sound engineers who have blown their own eardrums as they attempt to cater to an equally youthful generation of theatergoers that have suffered hearing loss from excessive nightclub and concert volumes. The sad part is the destructive distortion this sometimes brings to music, dialogue, and the talented voices of performers, as was the case on a number of occasions during this often-delightful show. One example would be the opening number, “Raining Men,” where screeching volumes made the number completely inaudible to the audience. It does not help that such budget-conscious touring productions opt for audio soundtracks and synthesizers rather than the costly pleasures of a real orchestra in the pit. 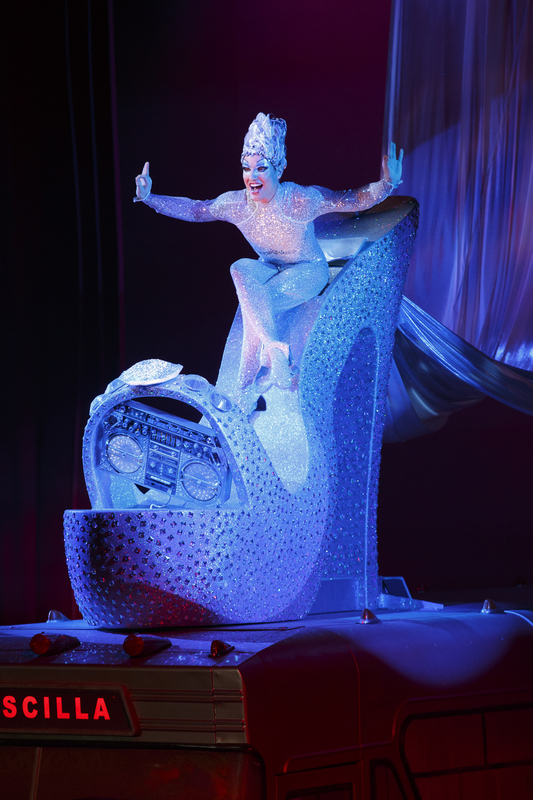 The Divas also add polish to Mr. West’s masterful and uproarious lip-syncing of the La Traviata aria, “Sempre Libera,” while he is seated in a glittering high-heeled shoe high atop the bus. Mr. Hart, meanwhile, gives us an affectionate characterization of Bob. He delivers a fine solo of the Jerome Kern/ Dorothy Fields classic, “A Fine Romance,” as he and Bernadette begin their unlikely love affair. Young Mr. Davis as Benji was a clear-voiced delight with perfect enunciation and boyish charm. The poignant “You Were Always On My Mind” scene that reunites father and son is a touching musical highlight of the show. It was not the only one. Why not come see for yourself? PRISCILLA performances continue in the Sarofim Hall of Houston’s Hobby Center through October 12th, with evening performances Tuesday thru Thursday & Sundays at 7:30 pm, Fridays & Saturdays at 8 pm. Weekend matinees are Saturdays and Sundays at 2pm. For tickets and information visit TUTS.com or call 713-558-TUTS. This entry was posted in Broadway, BroadwayStars.com, Houston's Hobby Center, PRISCILLA Queen of the Desert, Theatre Under the Stars, ThePeoplesCritic.com and tagged Broadway, BroadwayStars.com, Houston's Hobby Center, musicals, PRISCILLA Queen of the Desert, Reviews, theatre, Theatre Under the Stars, ThePeoplesCritic.com. Bookmark the permalink. It sounds like a blast! The Chronicle raved about the costumes too. Tennis Partner Hoping For a Bagel Next Match! Great review! My friend saw it this weekend and agrees completely!